If your kitty isn't eating, seems lethargic, or just isn't acting like herself, it's natural to wonder what is wrong. With cats, the symptoms of illness can be subtle, but they often offer a clue about the underlying problem. As always, if you're concerned, you should take your cat to the vet. Is Your Cat Acting Sick? Have your cat's sleep habits changed? Is your cat using the litter box less frequently or not at all? Is there a discharge coming from your cat's nose or eyes? Perhaps your cat's movement is different, or the animal is crying out well into the night. A symptom specific search will typically yield the conditions and diseases most commonly associated with the symptoms you have listed. However, this can still lead to some confusion if the symptoms relate to more than one type of illness. Doctors warn patients against self-diagnosis, and the same wisdom can be applied to diagnosing your pet's condition. Although hunting down the diseases that correspond most similarly to your pet's symptoms can be helpful, it's not the same as getting an accurate diagnosis from your vet. Feel free to share your research with your vet because it may provide ideas for your vet to pursue, but leave the actual diagnosis and treatment plan to your vet. Many diseases have similar symptoms which usually tends to complicate reaching the right diagnosis. A cat with a cold can mimic the same symptoms as feline leukemia. A pet owner may continue to flush his cat with homeopathic cure-all tablets to no avail. Another pet owner may think his cat has worms when his four-month-old female feline is actually experiencing her first heat cycle. This just goes to show that there's no substitute for your vet's expertise. 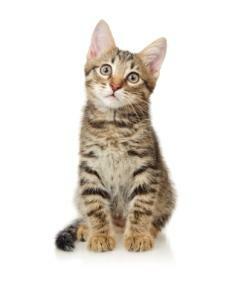 Your best bet regarding any significant or worrisome change in your cat's behavior is to take kitty to a veterinarian. Unfortunately, some pet owners have difficultly dealing with veterinarian costs. Testing, treatments and follow-up visits can become very expensive. Some tests alone can cost hundreds of dollars. In such cases, it may prove helpful to explore diet and lifestyle changes that can have a positive effect on your cat's health regardless of which underlying conditions exist. If your cat suffers from a malady such as feline immunodeficiency virus or feline leukemia, a diet and lifestyle change can still have a very beneficial effect on his longevity. Once a diagnosis has been reached, it can be helpful to hunt around the web for alternative treatments. Although self-diagnosing your pet can be very dangerous, asking your veterinarian about alternative treatments or engaging in some form of lifestyle support is seldom a bad idea. A cat that has recently been diagnosed with a chronic immune-weakening illness may need to be kept indoors for the remainder of its days in order to prevent exposure to uncontrolled environmental toxins. In the long run, you and your vet should work together to keep your cat as healthy as possible. Both of you bring unique skills and perspective to this task. Don't be afraid to ask pertinant questions about your cat's symptoms and diagnosis, but keep in mind that your vet has spent many years acquiring the education and practical experience that will help him diagnose what is actually wrong with your pet. Between the two of you, your cat should be in good hands.